Although I salivate while merely typing "Cheddar Bay Biscuits," I never think about going to Red Lobster for a meal out, especially lunch. But, this week the universe seemed to be telling me something. My mom was visiting this past week from Oklahoma, and one of her favourite restaurants is Red Lobster. I also received a nice e-mail from a saskmom.com follower named Trish who highly recommended Red Lobster as a baby-friendly restaurant in Saskatoon. So, I ended up taking my son, and my mother, to Red Lobster on 8th Street near Preston Avenue this week. I was pleasantly surprised. 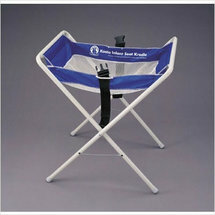 Red Lobster has these terrific Koala Bear Kare infant seat cradles that hold your infant's car seat at table-height. Trish put one to the test and said it was "fantastic." Red Lobster also provides a little box of new crayons that kids can use to colour their own activity sheet that also doubles as the Kids' Menu. The crayons are theirs to keep. Consider Red Lobster as a baby adventure for lunch or dinner, and feel free to pass on other kid-friendly restaurants in Saskatoon. When we ate at Red Lobster the staff took the time to let our kids feel the live lobsters. They took one right out of the tank and let the kids touch it if they wanted to. Of course my kids thought that was really cool. I thought they went beyond what they had to do to make our experience there enjoyable. That along with the coloring activities made it a hit for our kids - all three of them! I recently went to two very unfriendly restaurants. Earls and Belissimo(neither had high chairs), will never frequent those places. Glad to hear Red Lobster wants my service.